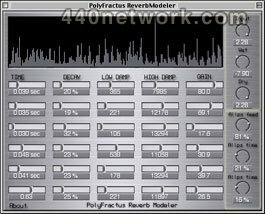 Plug-in pack: LoopDelay, Reson & ReverbModeler. A multi-tap (up to five 5 taps) delay (up to 5 seconds), with a Loop function. Each delay (tap) is chained with 2 filters (LPF & HPF), and routed to and adjustable stereo output. A multiple (up to 5) comb filters plug-in. For each stage, you can edit the (micro) delay, feedback and two filters (LPF & HPF). This room modeling plug-in uses 6 stages to create original reverb sounds. 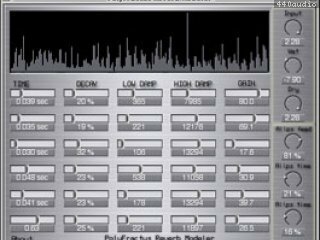 Any Macintosh software using STEINBERG-VST technology. Tested softwares: Emagic - Logic Audio Platinum, Steinberg - Cubase VST, TC - Spark, Bias -Peak.